This travel trailer will comfortable sleep your family of six on your fun camping trips. The rear bunk beds will be perfect for the kids, and with individual foot lockers, they can easily store their books or tablets. The front queen bed has storage underneath, giving you more space throughout the trailer to make it your own. This unit features a slide out with the dinette that can be converted to a bed. You'll love the kitchen with a two burner cooktop, a microwave, and plenty of counter space for meal prep. 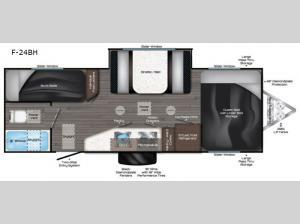 This travel trailer also includes a full rear corner bath for easy clean-up.